That’s right. We held a drummer hostage on a ramen run! Lately I’ve been gigging a lot with a reggae band called, SolRising. 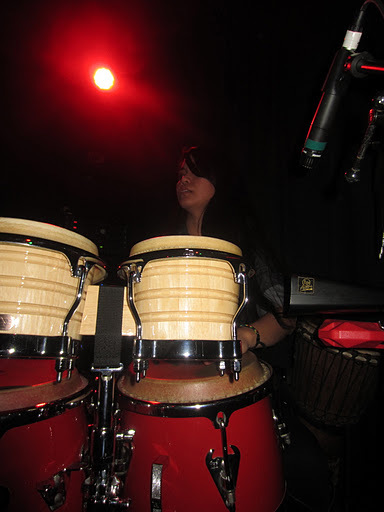 I play percussion and sing background vocals for the group. 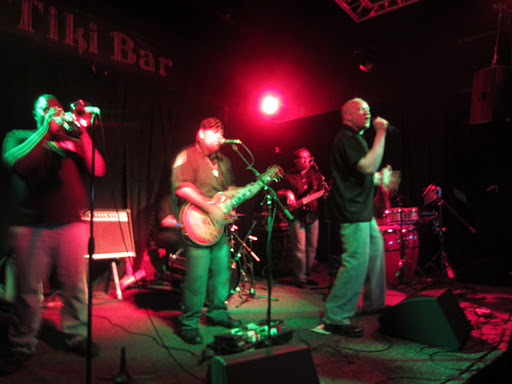 I had a gig out in Costa Mesa at a place called the Tiki Bar on December 17th. I brought along one of my best friends, Joanna, to the gig. After the show, I was all packed up and ready to go when the drummer, Thomas, followed Joanna and I to my car. He kept whining about us leaving right away, begging us to stick around and hang out with him, and just kept lingering next to my car. Well, it got to the point that I just made him get in the car, where he was forced to sit uncomfortably with all my drums in the seats, and took him over to Mentatsu Ramen. It was past 11pm at that point and Mentatsu was the only ramen place in the area that was open til midnight. We got there and had a difficult time finding parking. If you guys ever end up going here, make sure you turn into the first driveway before the light, into the plaza, because there is no other way in! We circled the block before we realized that we had to go back. This is when it gets bad that I don’t keep up with my blogs. I kinda forgot what I ordered. Haha. Luckily the menu is online! But that didn’t help either! I’m pretty sure I ordered their Tonkatsu ramen. I remember there was a “Special” menu on the wall, and tonkatsu was their special that week. 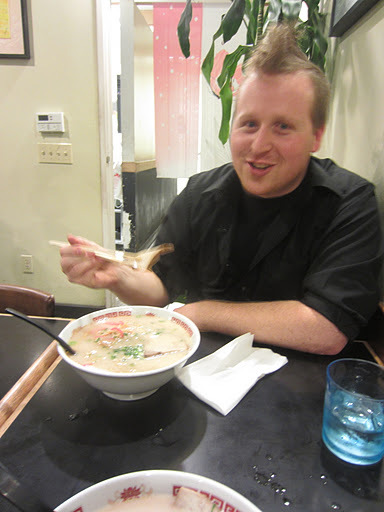 Thomas, who has never experienced authentic ramen, also had the tonkatsu. 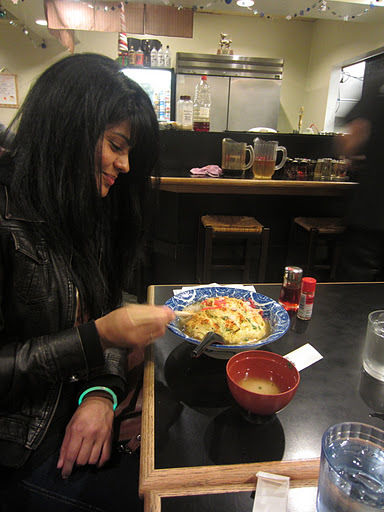 This was also my first time taking Joanna for ramen, but I was bummed out when she didn’t want to have ramen. 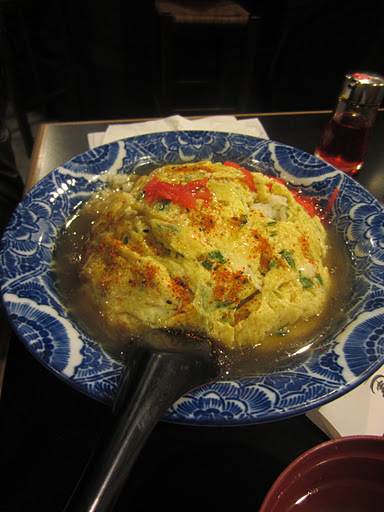 She apparently doesn’t eat pork whatsoever, so she ordered a seafood omelette over rice and soy sauce. Joanna doesn’t like getting her pictures taken. The ramen was pretty descent. I can’t remember much on how the broth tasted, other than the fact that it didn’t make me feel swollen. I’m pretty sure it didn’t have MSG. But then again, I didn’t finish the broth. I was bummed that it only had one slice of pork and it wasn’t as tender as I usually like it. I really liked that it came with kamaboko, (fish cake). 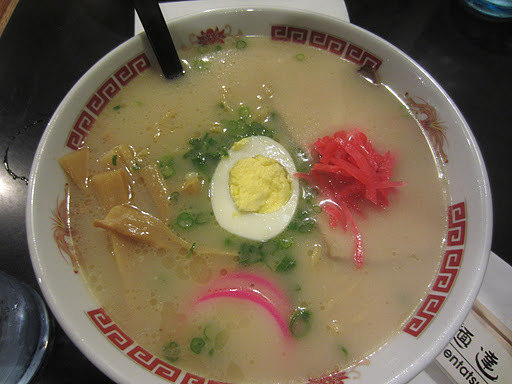 There aren’t a lot of places in SoCal that serve it with ramen. I have to say that the service was pretty lame. It took us a long time to get their attention, just for water and condiments. I actually got up and to grab them myself. Not cool. This place doesn’t stand out to me. Honestly, I can’t remember much of the ramen. I wouldn’t drive out of my way for this place. Which is sad because it seems that lately I haven’t been able to find another ramen place I would drive out of my way for. 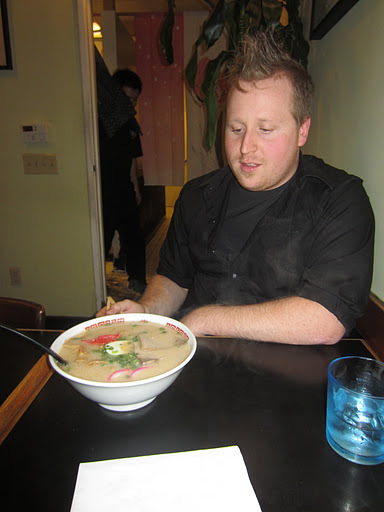 I think it was an okay place to let someone, like Thomas, have ramen for the first time. I hope he liked it! I think he liked being held hostage and being forced to eat ramen. Hopefully I’ll be better with keeping up with these blogs. I apologize that I can’t give a full run down on how the ramen was. You’re just gonna have to trust me when I say that I wouldn’t drive out of my way to this place. Plus, the service sucked anyway.